Deborah (Teach Preschool) provided me a copy of Ready for Kindergarten free of charge for use in writing this book review. The free book did not sway my review in any way! I just love Teach Preschool, so when Deborah was looking for bloggers interested in participating in a book study to review her new book, I was first in line! S is in her last year of preschool and will be starting Kindergarten next fall....GULP! 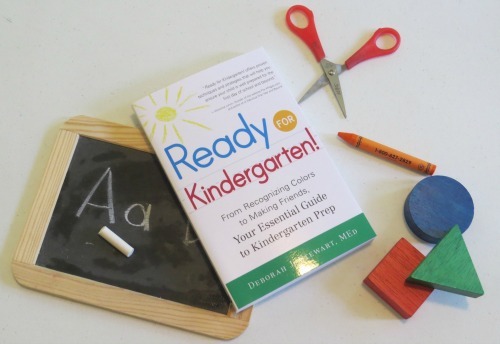 Deborah's book, Ready for Kindergarten , is a comprehensive and well organized guide to making sure your child has the skills they need to succeed in Kindergarten. With a Master's in Education and over twenty years of experience in Early Childhood Education, Deborah is a font of knowledge. She's managed to include it all in her easy to navigate book. Deborah has broken down each skill, explained the reasoning behind it, and given several fun ideas for ways to practice/learn the skill. I love that she takes a play-based approach to getting kiddos ready for school. It's really a fabulous read - if you have a little one getting ready for Kindergarten, I highly recommend it. For the book study, each blogger has chosen a skill discussed in the book to highlight. Since S adores storytelling, I chose that skill. In the book, Deborah explains that part of the framework for readiness to read is understanding storytelling: "As your child is building his interest in reading, the ability to retell or tell a story will reinforce his understanding of content and his ability to communicate events in the order in which they happen." For my post today, I thought I would share a few of S and my favorite ways to build her storytelling skills. S loves to create art, so I often present her with opportunities to combine storytelling and art. In this particular instance, I asked her to paint this little deer's story. She generally tells the story aloud as she paints. She had me write a bit of what went on in the upper left hand corner: "Once upon a time there was a deer. And she walked up here, there, across the bridge, and a river - and that's how she got lost." She's illustrated the entirety of the deer's long journey in a map form below. The triangular brush prints represent the deer's hoof prints. She was lost and was searching for her home and her mother. She traveled really far, around several lakes and across rivers. You can see that along the way, she encountered houses, a garden, a forest, and several children. Another game we play involves stickers or stamps. Using the stickers/stamps, S creates a scene and presents it to my husband or me (or sometimes both) and we make up a story. Once we've told a story involving all the characters pictured in the scene, S will take a turn and tell her own. Sometimes she or I will challenge the other to tell a different story using the same scene. We love using this Reusable Stickers and Scenes Set for this game. S finds it particularly amusing to add a strange animal or two (in this case the giraffe) and she also gets a good giggle out of placing some of the characters upside down. Another favorite activity is making her own books. We generally aren't very fancy - we just fold up and staple some plain paper - but S very much enjoys being read her books for months after they've been made. They are up on our bookshelf mixed in alongside all the other paperback and hardcover books. :) When S was much younger, I would illustrate for her. Now that she's four, my job is solely to be the scribe and she's the illustrator. Other times, it's an imaginary story. I cannot tell you how much I love that all her imaginative stories are about chickens. They all start "once upon a time there was a chicken", and every time I die laughing. She is too cute. Another storytelling game we love involves our Memory game set. To play you shake up all the cards and when it is your turn, you draw three cards. You then tell a story that involves all three items. If you pull a double, you can draw again (or you can work two of that item into the story). If you don't have a Memory game set, you could make a set of these pretty easily yourself with clip art or by hand drawing pictures. A nice balance of animals, food, and household items seem to make the best fodder for storytelling. Small worlds are another great way to encourage storytelling. S loves being able to manipulate the characters and scenery directly with her own hands. We have several of our Simple Small Worlds up on the blog. Here S is playing with Dinosaurs and Sticky Mud. Lots of great stories about each of the dinosaurs and the trouble they were in - and how they were rescued! And finally, S loves family stories. One of her favorites to hear and then retell herself is the story of the day she was born. I find that most children really enjoy their birth story and/or any silly stories from when they were small. I love that this is great practice for her to understand and remember the sequence of a specific series of events and to learn a bit of her/our family history. Hopefully these activities give you some ideas for how to encourage storytelling in your little one. For even more ideas on encouraging storytelling as well as a bounty of ideas for building other skills for Kindergarten readiness, check out Ready for Kindergarten ! And be sure to check out the fabulous ideas from fellow bloggers shared as part of the Ready for Kindergarten book study here! What a great imagination your little one has! I love the chickens! lol. 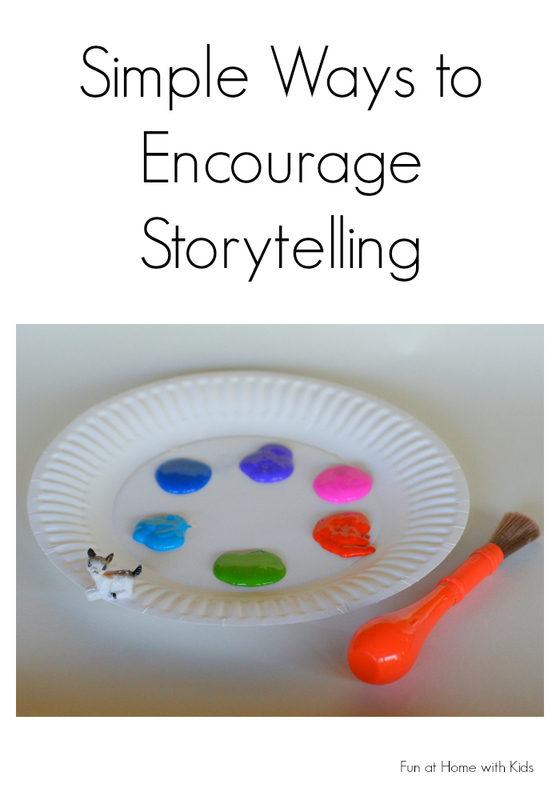 These are wonderful ideas for encouraging storytelling. Sometimes all kids need is a little spark to set their imagination into high gear. Thank you, Emma! The chickens are totally hilarious!! I love this post, Asia! You've given me some great ideas to expand my little guy's interest in storytelling. Thank you, Ann! You always leave the nicest comments!!! !